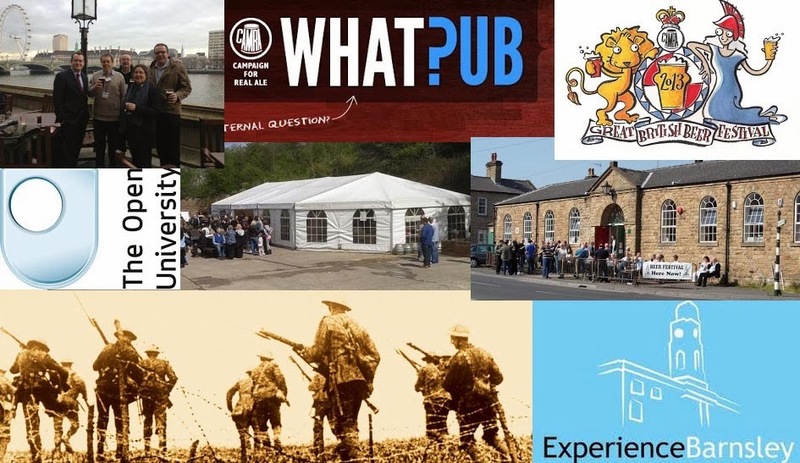 A Barnsley Historian's View: Clever or Delusional? And is there something to be said for the latter? Clever or Delusional? And is there something to be said for the latter? Last night, as I donned my rubber gloves to do the washing up at 10pm, I asked the OH if he thought I was clever. "Of course you are," he replied. "And you keep telling me I am too. But if we are both clever why are we unable to sell the other *@%!! * house?" He was just on his way home to the said house where he has to spend the majority of the week as we couldn't afford to pay the council tax if he lived here with me. I've got a Christmas compilation CD on at the moment and Mariah Carey is singing "All I Want for Christmas is You." Well, it would be nice to have my husband for Christmas and for the rest of my life ... I thought that was the general plan when you got married. The old house been up for sale for over two years now, and we've dropped the price several times, to the extent that if it sold today we'd be now be worse off than we were before we moved. I'd been made redundant so we had a nice bit of cash that it seemed foolish in these days of low interest to leave sitting around in the bank. I'd budgeted and struggled to pay off the original mortgage before I was finished by my employers - we never had big holidays, just voluntary work at beer festivals and the occasional long weekend. We don't do fancy clothes or expensive meals out, I like history books and the OH likes beer and we get along fairly simply. We looked into having a loft conversion, but the layout of the old house meant that this would involve fire doors and all kinds of complications, and the loft space really wasn't that big ... then we looked at moving nearer to the OH's mum ... and we fell in love with the house that had belonged to the OH's old primary school headmaster. I think that for him buying it was a kind of proof that he'd done well for himself - "Hey look Mr B, I can live in your house!" 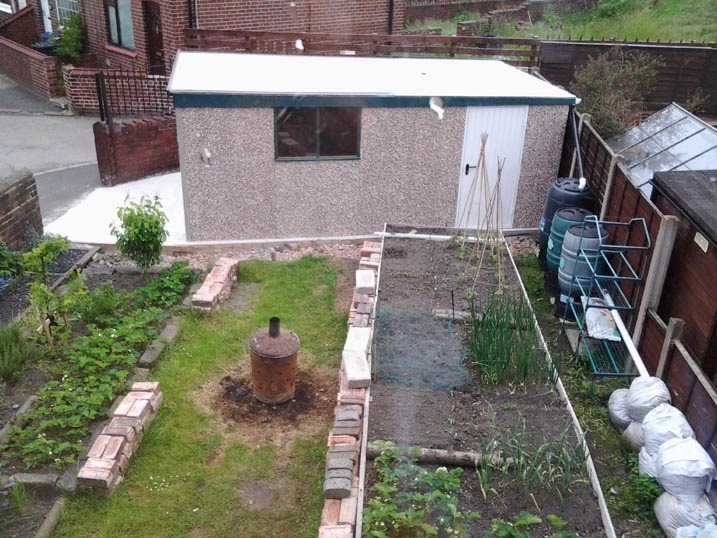 It had a much bigger garden, which I wanted and had options for improvement unlike the previous one which had been extended and redecorated and done up so well by the previous owners that all you needed to do was live in it ... which is a bit boring to be honest. We made all kinds of plans, ploughed all our money and a bit more into it and were very excited. Our new back garden - in need of work! But that's gone and past now, we are into phase two, which is fairly desperate. I can't work any more and don't get any benefits or allowances. If it wasn't for my mum's generosity I wouldn't have been able to enrol on my last two Open Uni modules. The garden has been stripped of Mrs B's shrubs and bulbs, but the raised beds are only made of old scaffolding planks and are beginning to rot. I've been very grateful for it this year, lots of carrots, green beans, onions and strawberries. We still have a few leeks and parsnips to pull. But with the OH living in the other house I have to do all the gardening and other household thingys ... and I get tired so easily. And it's lonely by myself. People have suggested we rent the old house out - but it wouldn't bring in enough to pay the mortgage and I really hate the idea of other people wrecking my lovely kitchen and the carpets and curtains which we left there. I don't think I could cope with the stress of worrying about the cost of repairs and redecorations and damage and so on. The council offered to lease it from us for ten years (part of their Empty Homes policy) for £1,000 a year - well that wouldn't pay the mortgage either! This morning I woke at 6am (the cat - you all know about the cat by now I'm sure) and couldn't get back to sleep. I read Facebook and Twitter and watched a really sad video about the effects of the Work Capability Assessment on people with mental health problems. I'm not so badly off I know, but some days I just get very down about it all. Am I clever? If I was so clever I'd be able to think of a way out of this. Or should I just carry on regardless, living for the day and not over thinking the whole thing. I wish I could afford to go to the pub ... that used to be my answer to everything twenty years ago ... I wish I had a local to go to! You see, there I go again - overthinking the problem and putting obstacles in the way of even going for a beer. Ah, well. Soon be Christmas! Hmmm?! Do you know what, clever or otherwise (and for what it's worth, I don't think either or you fall into the "otherwise" category) the situation with the house is nothing directly to do with you, and everything to do with the market we find ourselves in. One idea I wonder if you have tried (although you very likely have!) - have you tried making up some little A5 flyers advertising it and popping them through doors in the local area? While people in THOSE houses won't be wanting to buy it as it's effectively what they already have, you just might get one who's looking for somewhere for parents or other relatives to move to close by, or even a first time buyer wanting out of rented but to stay in the area, who've for some reason not seen your place? Not Neglecting You - Honest!